IIHS' Highest Standard of Safety "2014 TOP SAFETY PICK (TSP) +"
● New "EyeSight" achieved the highest possible rating of "Superior" for front crash prevention. ● With seven models that have earned 2014 safety awards from IIHS, Subaru has more 2014 Top Safety Picks than any other brand. Tokyo, November 28, 2014 – Fuji Heavy Industries Ltd. (FHI), the manufacturer of Subaru automobiles, today announced that the Insurance Institute for Highway Safety (IIHS; a nonprofit organization supported by auto insurers in the US) has awarded the highest standard of safety, 2014 TOP SAFETY PICK+ (TSP+) along with the highest possible rating of "Superior" for front crash prevention to the 2015 Subaru Impreza (US specs. ), equipped with Subaru's new version of EyeSight* driver assist technology. By adopting the EyeSight for 2015 model, Impreza earned 6 of 6 points for front crash prevention. Including 2015 Subaru Impreza, Subaru has seven models that have earned 2014 safety awards from IIHS – four with TOP SAFETY PICK+ and three with TOP SAFETY PICK. Subaru has more 2014 IIHS Top Safety Picks than any other brand. The EyeSight was the first system ever to use only stereo camera technology to detect the objects such as vehicles, pedestrians and cyclists. Since its Japanese debut in May 2008, features available on this system have been highly praised; they included pre-collision braking control and all-speed range adaptive cruise control tracking function. New EyeSight incorporates fully revamped stereo cameras that increase viewing angle and range by approximately 40% to further improve preventative safety and driver load-reduction features. To win TOP SAFETY PICK, a vehicle must have "Good" ratings in all four tests of high-speed front and side crash tests, a rollover test, and evaluations of seat/head restraints for protection against neck injuries in rear impacts. In addition, "Good" or "Acceptable" performance in a small overlap front test introduced in 2012 is also required. 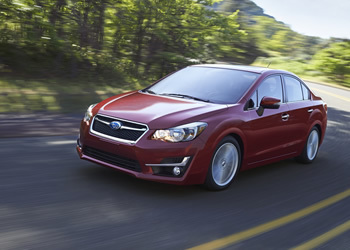 The 2015 Impreza earned the highest possible rating of "Good" in these five IIHS evaluations for occupant protection. The same level of performance in those tests, along with a "Basic", "Advanced" or "Superior" rating for front crash prevention, is required for the higher accolade, TOP SAFETY PICK+. *: EyeSight(ver.3) as it is known on the Japanese market.